Professor Michael Roberto is a colleague of mine at Bryant University in the Management Department. Mike has been developing an excellent blog on leadership, decision making, and competitive strategy. The url is given below. The blog is a valued resource for students and professors of business and the general reader interested in management and leadership issues. Mike’s comments on the current business environment cover a broad range of topics and I find them to be very insightful and informative. Mike has written two books on the topic of leaders and leadership. His latest book is called, “Know What You Don’t Know” and is widely available through various outlets like Amazon. Mike is a great person to talk to and very helpful to his colleagues in sharing his knowledge of teaching and learning methodologies. Mike will be part of a workshop at the Academy of Management in Chicago (August 7-11) that will teach other professors about how to start a blog and use it for educational and professional purposes. I am very enthusiastic about finding professors and colleagues like Mike who are writing and sharing on the Internet on business and management issues. I love reading Professor Michael Roberto’s blog and highly recommend it to others. manifesting in His infinite mercy to remove the illusion of duality. everywhere manifesting in everything. Chitta chora! Chitta chora! Steal it all and give me only one thing in return…your holy Presence. in gratitude for the Grace you have brought into my life. otherwise He is always within, doing the needful. From Talks with Ramana Maharshi, 12th June, 1937 Talk 426. 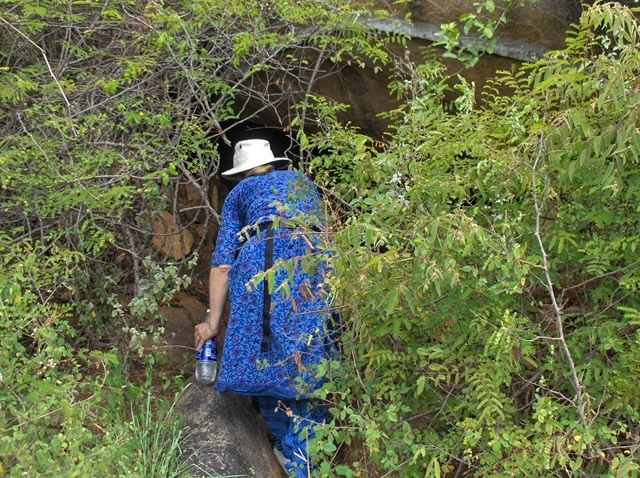 As we have been exploring Arunachala we keep finding ‘caves,’ some already widely known, and some not. 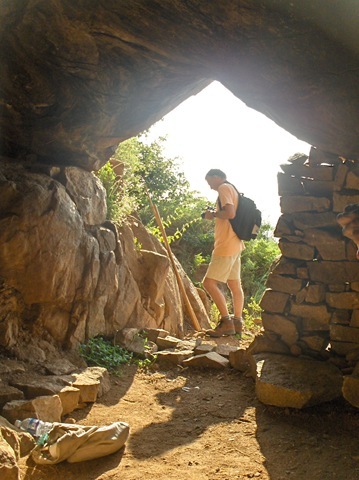 A friend suggested that we write about these caves in a blog. This seems a good idea, so here it is. We can find nothing like this available now. 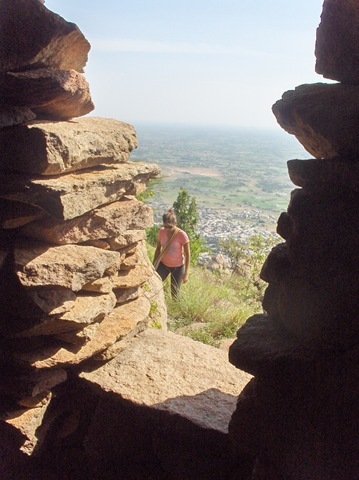 Our exploration of Arunachala is ongoing, and any additional caves we find will be added. In this post 1 refer to other postings where there are more photos and information about each of the caves. I put quotes around the first instance of ‘caves’ since what are called caves here are often nothing more than a sheltered space under a big rock. Some are natural, some have been improved, usually by building walls and adding a concrete floor. Some have been dug out under rocks. Is some cases the individual caves already have names in common use. Most do not, and for the purposes of this listing I am calling these by names that I made up. If other caves are known, or names of caves shown are known, let me know, so I can update this listing. 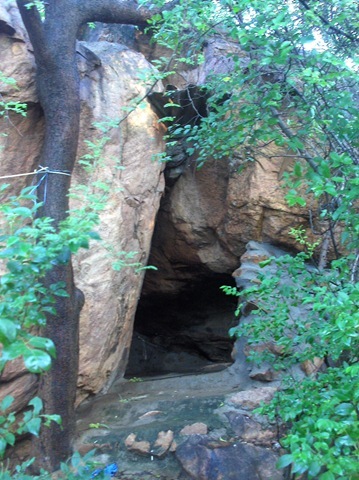 The December 2008 posting showed 18 caves. In July 2009, it now shows 23 caves. 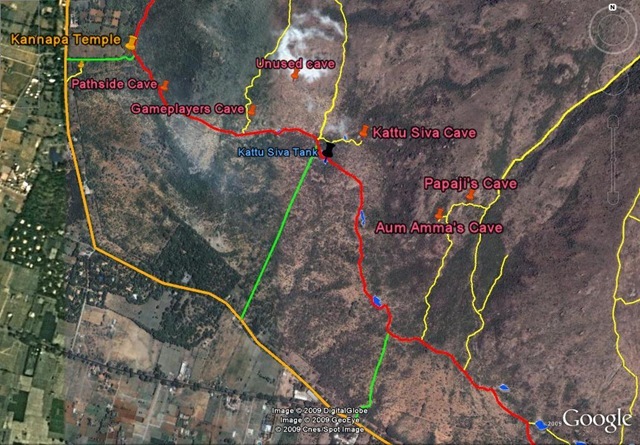 Maps, developed from GoogleEarth tm are also added that show the location of each of these caves. 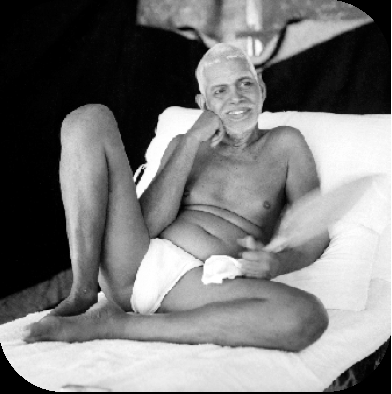 Virupaksha is, for most, deeply associated with Sri Ramana Maharshi. Ramana lived where he lived for 17 years [1899-1916]. 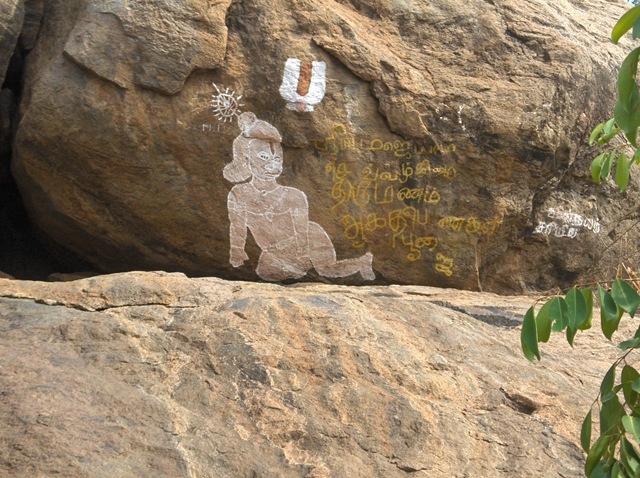 Below is a famous photo of the young Ramana at Virupaksha cave. 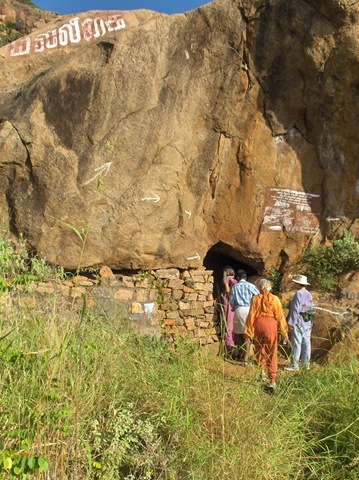 The cave is named for a famous saint, Virupaksha, who lived in this cave in the 1500’s, around the same time as Guhai Nama Shivaya lived nearby (see below). 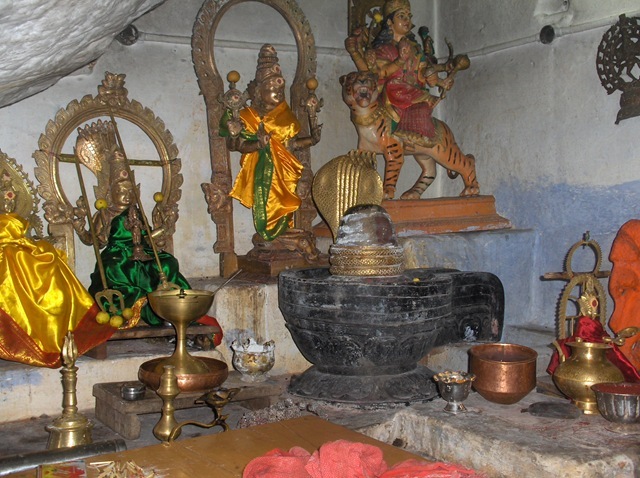 At Virupaksha’s demise, called here ‘maha samadhi,’ it is said that his body was transformed into vibhuti (sacred ash). 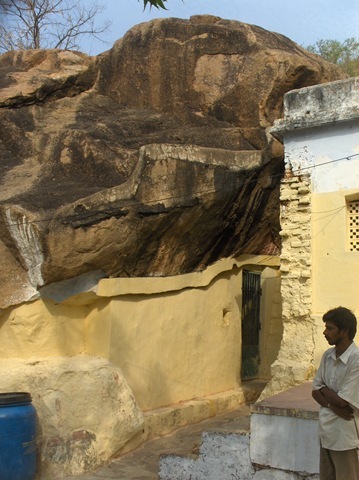 In the interior of this cave there is a mound in the shape of Arunachala. It is said to be made of this vibhuti. 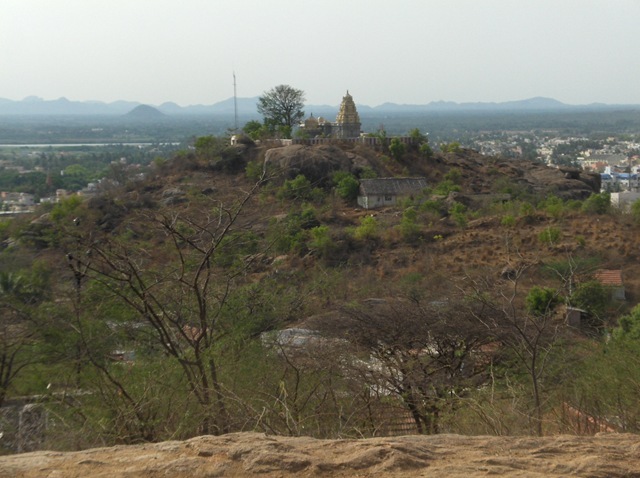 More on Virupaksha Cave is in this post. 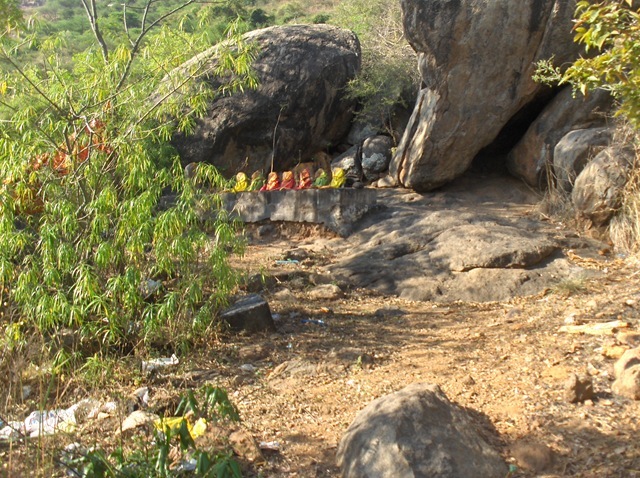 During the Virupaksha days, Sri Ramana would come down to Mango Tree Cave during the summer. 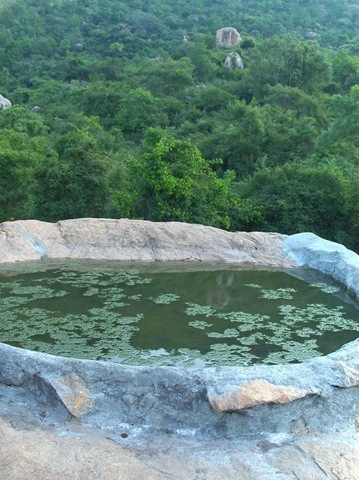 It was cooler, and there was water here when there was none at Virupaksha Cave. 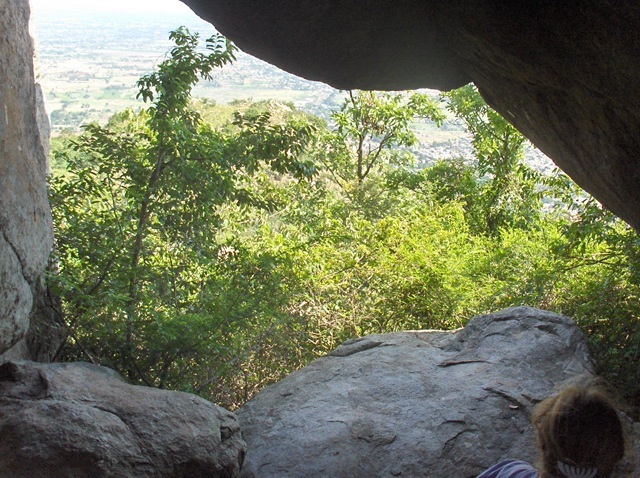 Mango Tree Cave is on the common way up the hill to Virupaksha Cave. Inside the building, to the back, there is the actual cave. I think the building has been added since Ramana’s time. 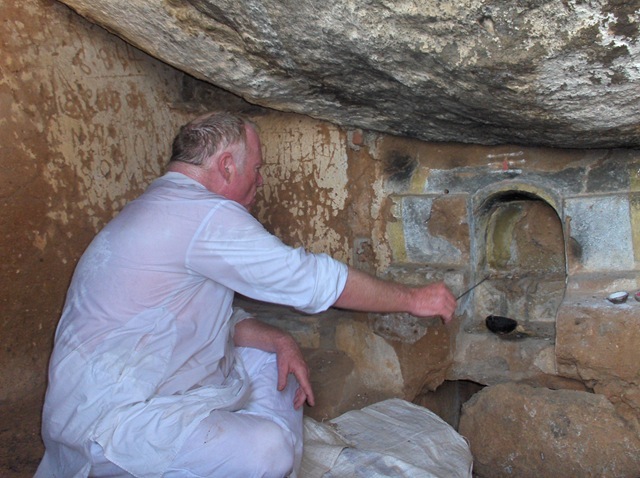 Now this small cave is filled with lingams and murtis of many gods. More on Mango Tree Cave can be round in this blog entry. 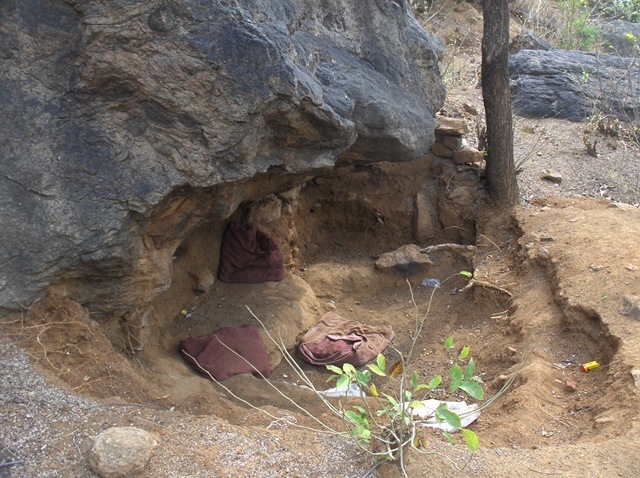 This is another cave in which Ramana lived in 1899. It is here that he wrote the notes which later because the pamphlet, Who am I? 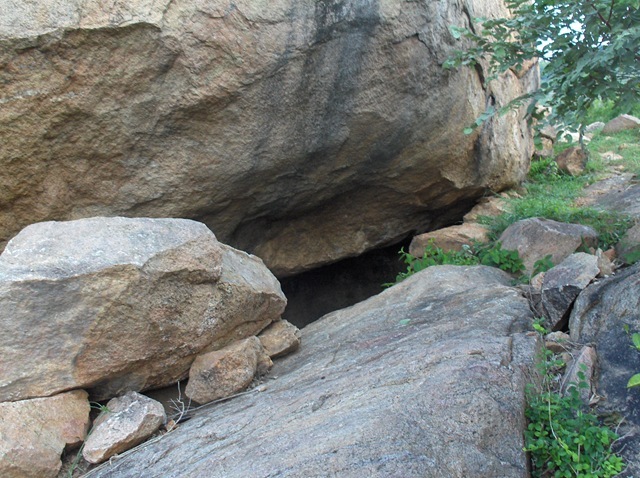 A bit more on this cave is in the post New Access to Ramana Sites below Virupaksha. Guhai Namasivaya is known to have been born around the year AD 1548 in Karnataka to a pious Saiva couple. His spiritual nature became evident at an early age: he was virtuous in his conduct, adept at his studies and evinced no attachment to worldly matters. 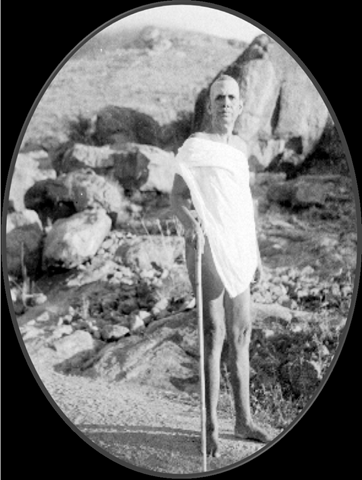 He practised his system of yoga for many years and as a result of the dream guidance of Lord Mallikarjuna, the presiding deity of Sri Sailam, Guhai Namasivaya came to Arunachala and remained as a Guru, giving teachings to mature disciples who approached him. 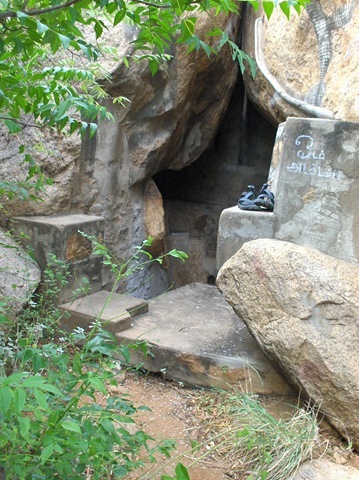 Tortoise Cave (also called Turtle Cave) was frequented by Sri Ramana during the Virupaksha days. 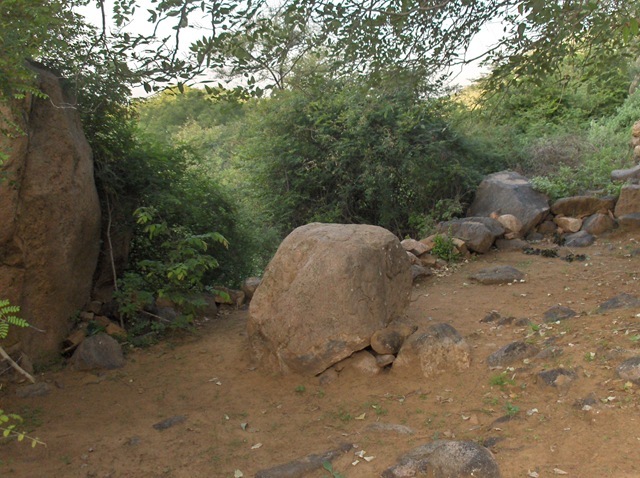 In those days, there were few trees on Arunachala, and not many places with shade. Tortoise Cave has a good flat stone at its entrance to sit on. Here you are in the shade, and there is often a breeze. 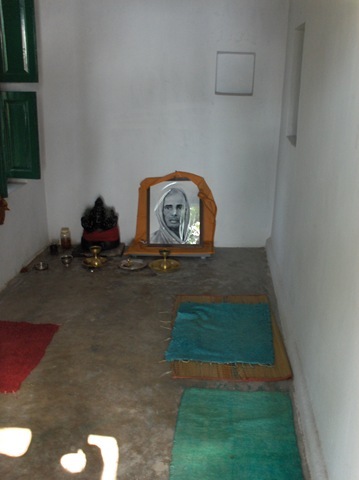 This is also the place made famous in the story of Sri Ramana’s ‘second death experience’. 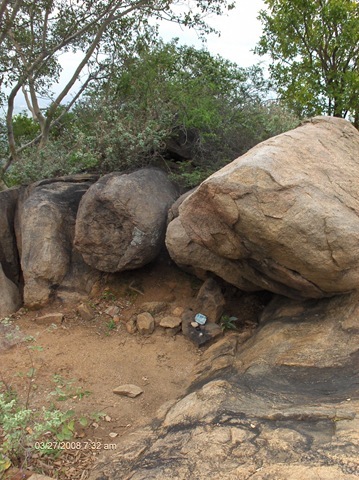 This happened when Ramana stopped at Tortoise Cave / Tortoise Rock on his way back from Pachiaimman Koil. 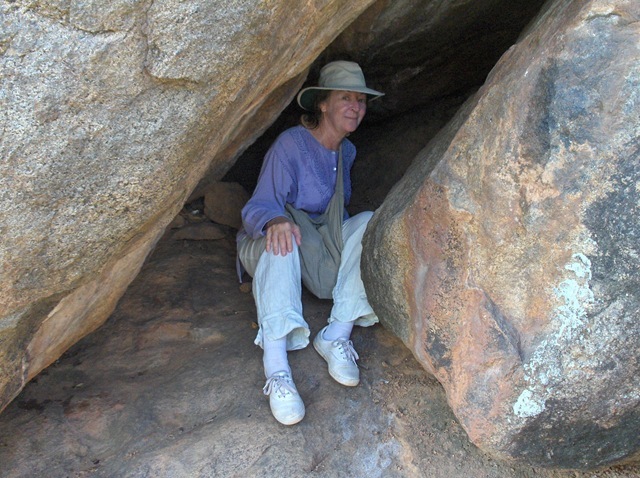 More of Tortoise Cave and Rock, and Ramana’s second death experience is in this post. More about Tortoise Cave is also in this post. 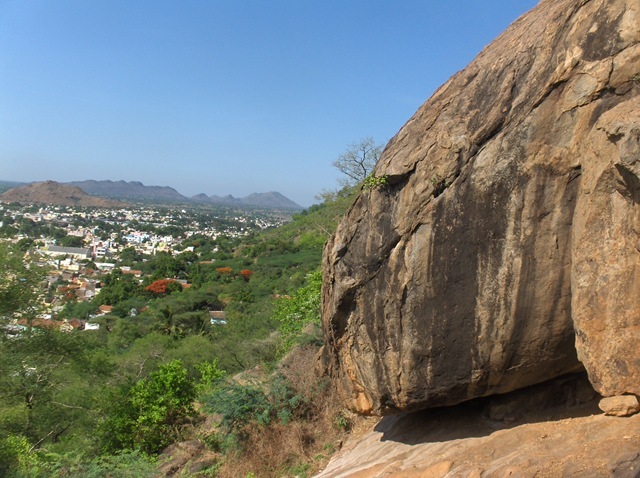 From places like Pavala Kundru, Tortoise Cave can be seen as a dark triangle up on the mountain. It is a bit of a climb to get up here. We think it is worth it. You will want to take a Mountain Guide the first time, I think. 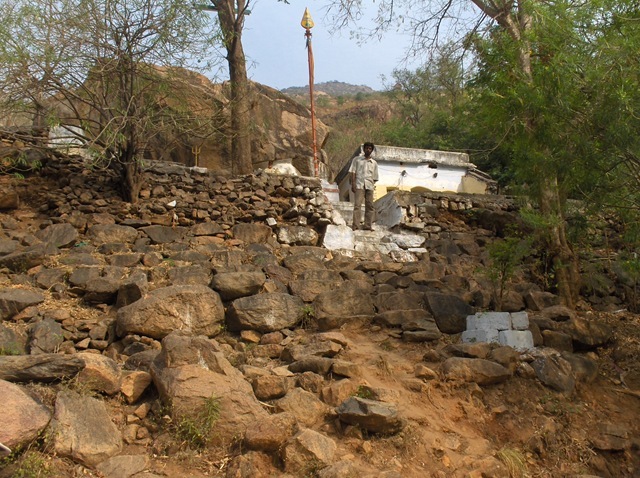 Arunachaleswara Temple for Tortoise Cave. A wonderful view. 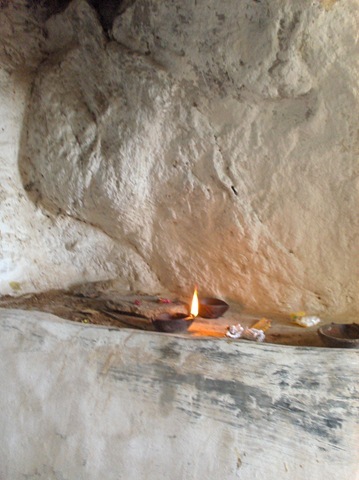 This rock at the entrance of the cave is where Sri Ramana would have sat and rested. And meditated. Pavala Kundru can be seen toward the left. Here is a close up view of the face of the turtle on Tortoise Rock. 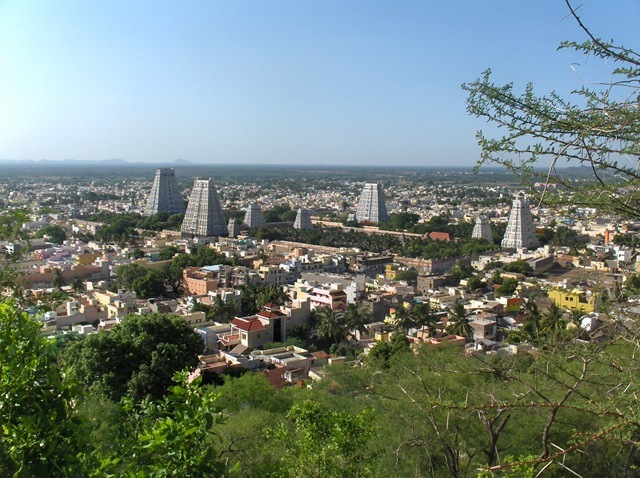 Tiruvannamalai is in the background. 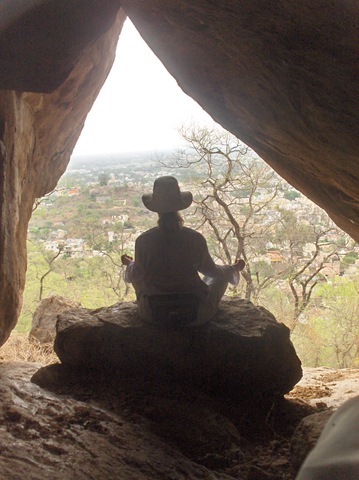 This cave is a great place to sit in the shade and meditate. More on Skandashram is in the post Walking up to Skandashram. 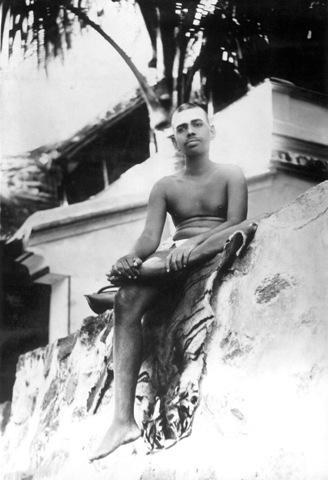 Sri Ramana lived at Skandashram from 1916 to 1922. His mother joined him during this period, and for the first time cooking was done there. 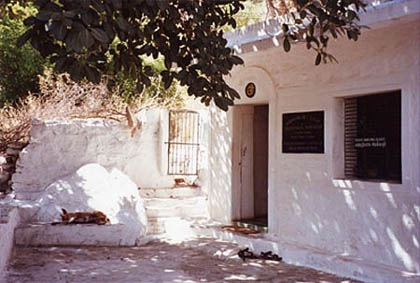 This is where the mother had her maha samadhi in 1922. Her room is now a shrine. 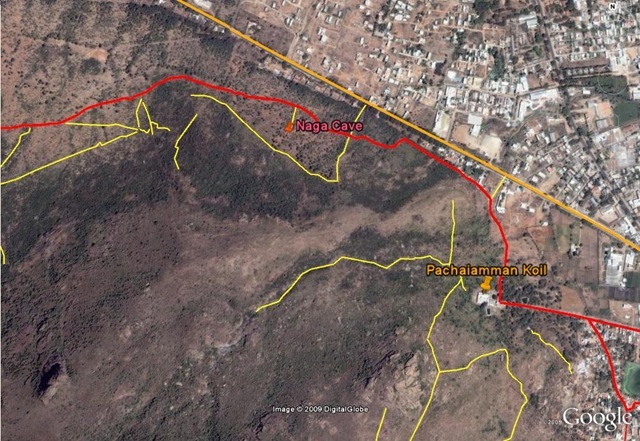 The map below shows all of the caves associated with Ramana, as well as other caves in the Virupaksha Cave area. Double click to expand. This is a cave, said to be greatly improved by the work of David Godman in the 1980s. Maybe ten people can fit into this cave. Looking out the entrance. 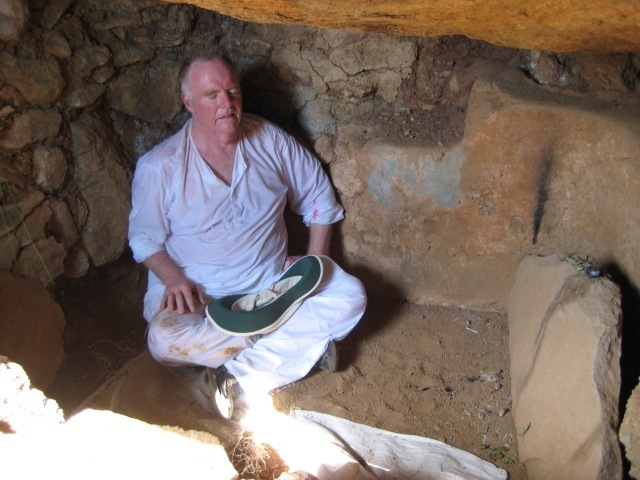 John, the archivist at Ramanasramam, stands outside the entrance. 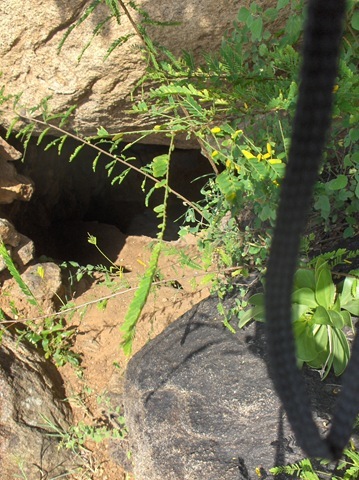 This is first of three caves found at Seven Springs. 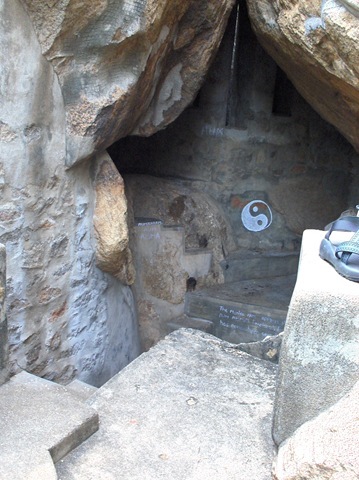 There is a stone entrance built, and a good altar in the cave. Maybe four people can fit in here. Up the hill you can see stonework. The entrance, from the inside. Richard, offering incense to the altar. 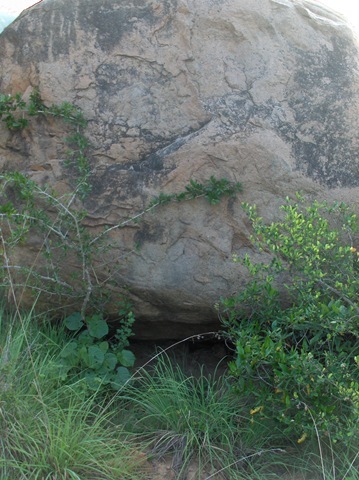 This is a small cave, behind Seven Springs 1. Maybe two people fit inside. Many stone and concrete improvements have been made. Richard, meditating in the cave. 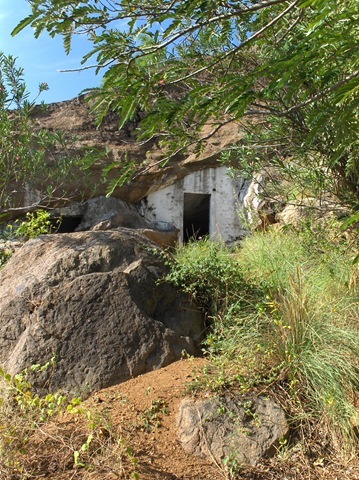 I call it ‘Ramana’s Resting Cave’ since this is the cave that is documented in writing about Ramana where he was known to rest, while others made the climb up to the top of Arunachala. It is in the shade all day with a nice breeze through it, and a view out through green trees. The entrance is a bit tight, though. 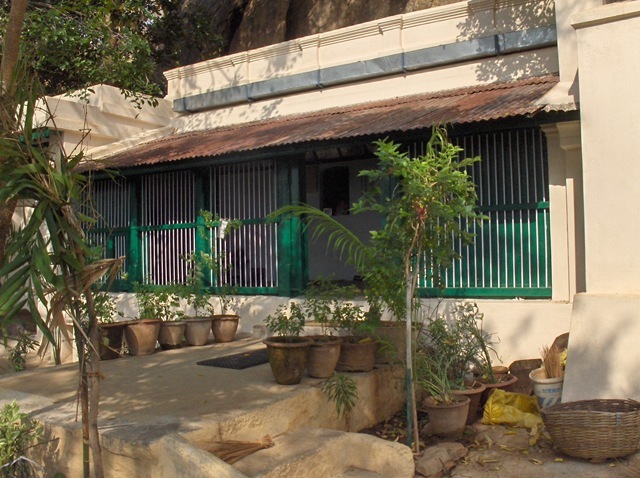 The Palamaram Ashram and is ‘generations’ old and has been run by one family for these generations. Palamaram is the Tamil word for ‘jackfruit’ (but we did not see a jackfruit tree). The guru who was most recently active here, per our mountain guide, was Palamaram Swamy, who was here for 40 years and for the last 15 years has been in the Himalayas. Steps lead up the the ashram. The flag pole can be seen from down the hill. The cave is under this rock. The doors into the cave are locked, and you will have to see if you can find someone who can open them. Often you cannot find the person. 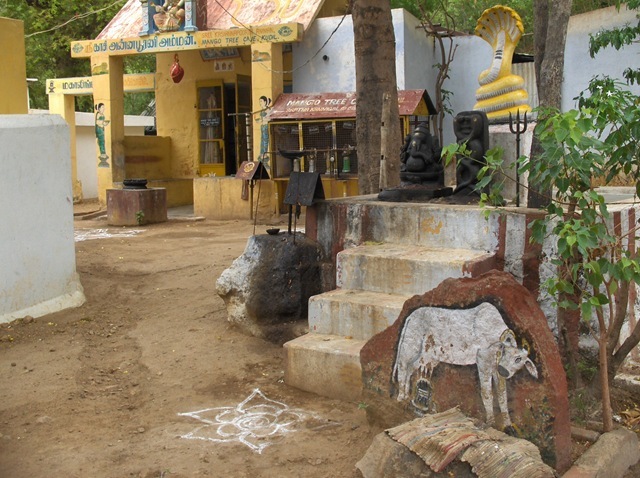 For more on this place, see the Palamaram Ashram Post. 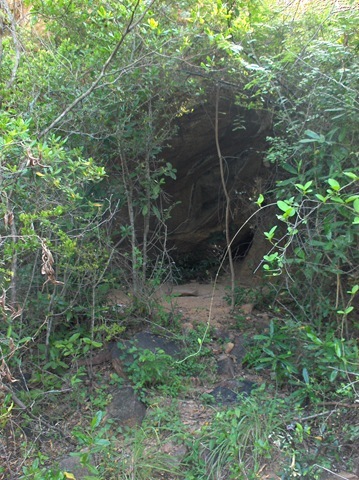 Wedding Cave is a small cave to the north of Virupaksha. It is rarely visited by westerners. We just discovered it by accident, looking for some other place. It is at the base of the hill. You have to travel through residential areas, then up hillside trails to reach it. 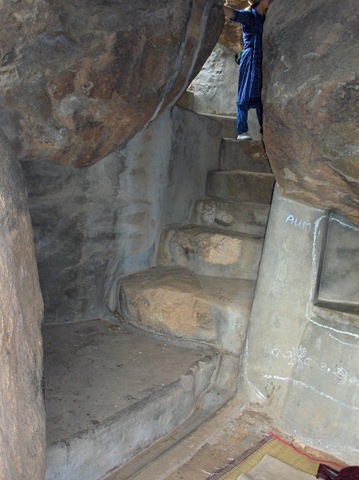 To get to the cave, you have to climb up the rock, to the right of what can be seen in this photo. Krishna is painted on the rock, with a peacock feather on his head. 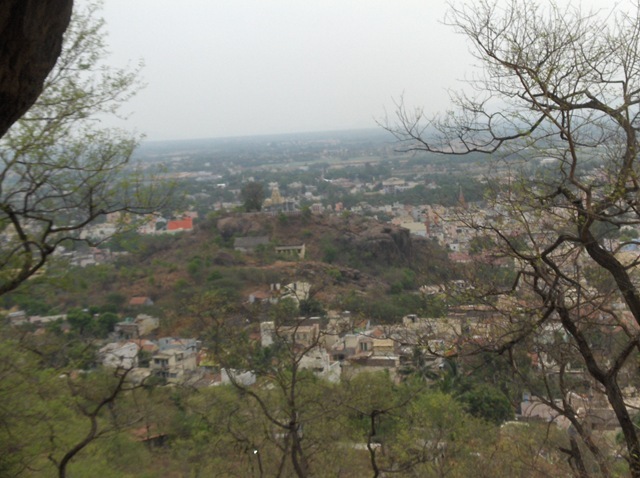 A great view of Pavala Kundru can be seen from here. More is found in Wedding Cave Post. 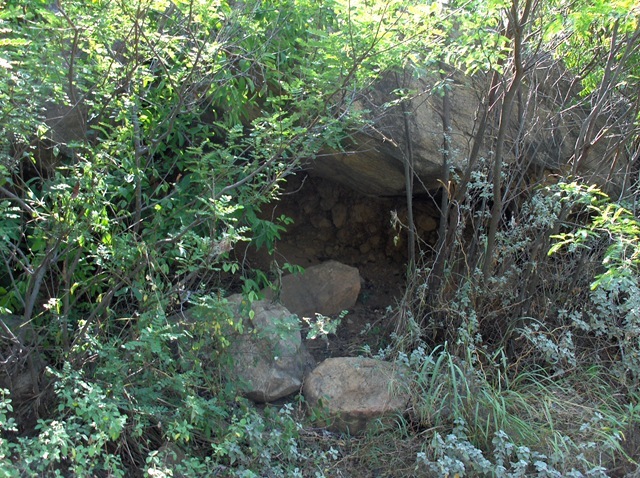 Dugout cave is a made made cave under a rock below Tortoise Cave. To get to it, you go through the hillside,m like shown below. A nice spot has been bug out under this rock. There are several cushions laying in the cave. Maybe there was a smaller cave, that was ‘improved’ to make a better space. I know nothing of the history of this cave. Another photo of the terrain around this cave. 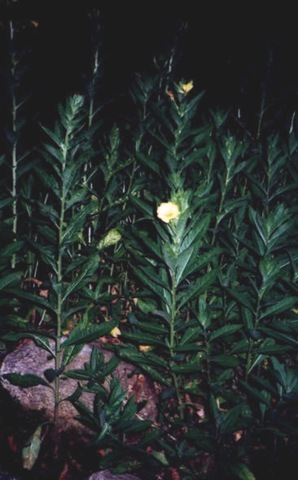 This is seen as a part of this post. 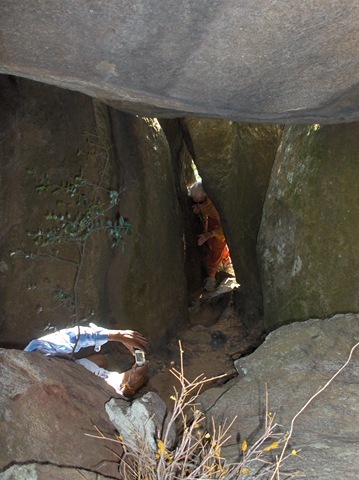 These caves are described in the post New Access to Ramana Sites below Virupaksha. This cave is big enough that one or two people can sit in it. This cave is very small. One person can lie down in it. 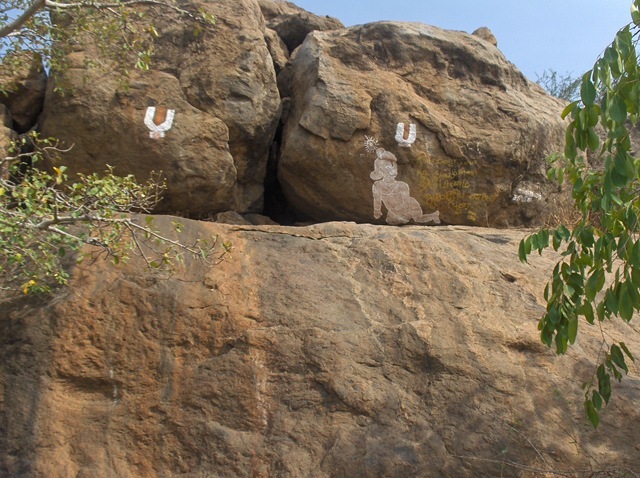 Below Virupaksha 3 – Associated with Ramana? 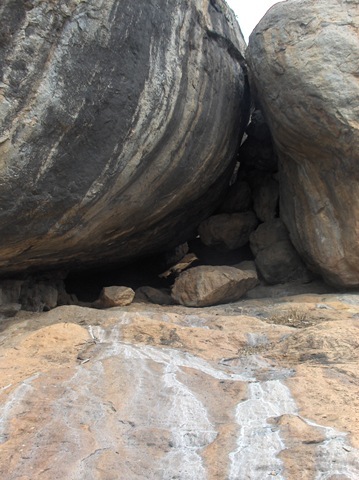 This cave is said by local villagers to be one used by Ramana in the early days. Recently, people have built walls and a door and an altar in it. 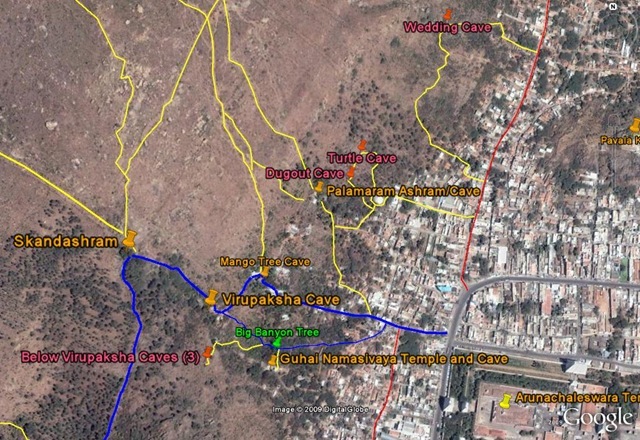 This map shows (right to left) Papaji’s Cave, Aum Amma’s Cave, Kattu Siva Cave, Unused Cave, Gameplayers Cava (Mankala Cave), and Pathside Cave. 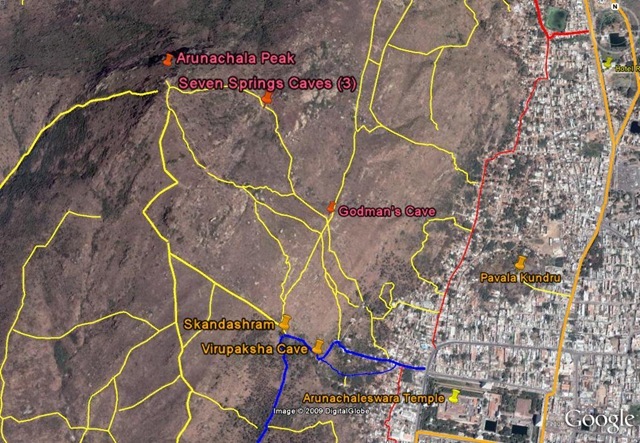 These caves are shown in the posts Papaji’s Cave and Aum Amma’s Cave. 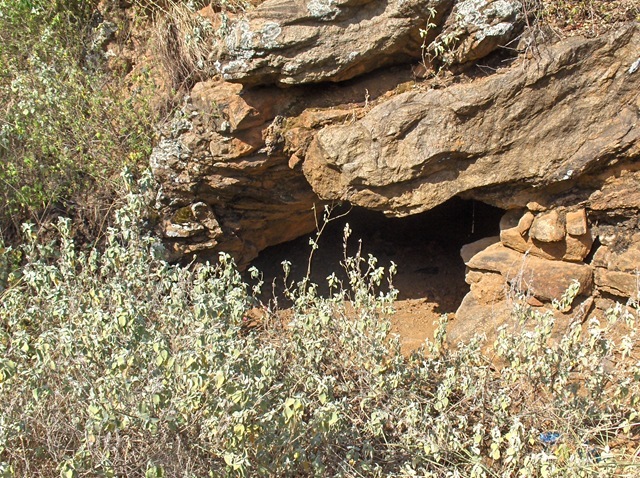 The first ‘cave’ of Papaji’s is in the area where part of his ashes were scattered. This is a nice place to sit and meditate at the altar that has been set up there. 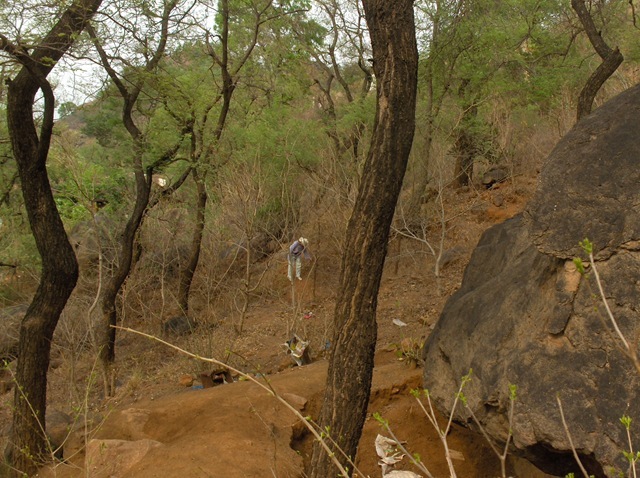 The next of the caves named for Papaji, and one that he is said to have lived in, is near the first cave, down the rock and a bit up the path. 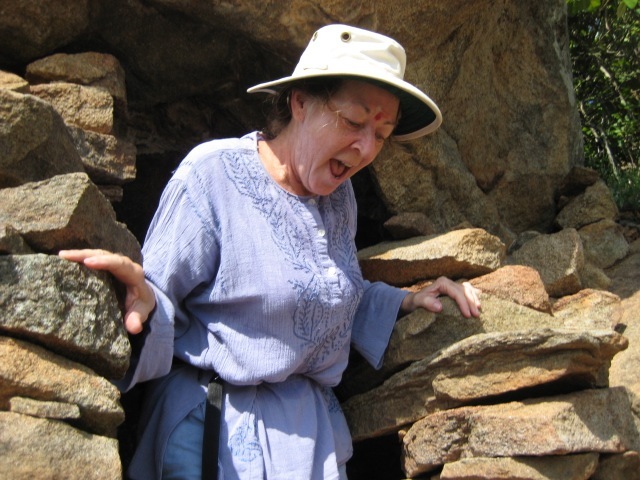 Carol enters the cave from the path. 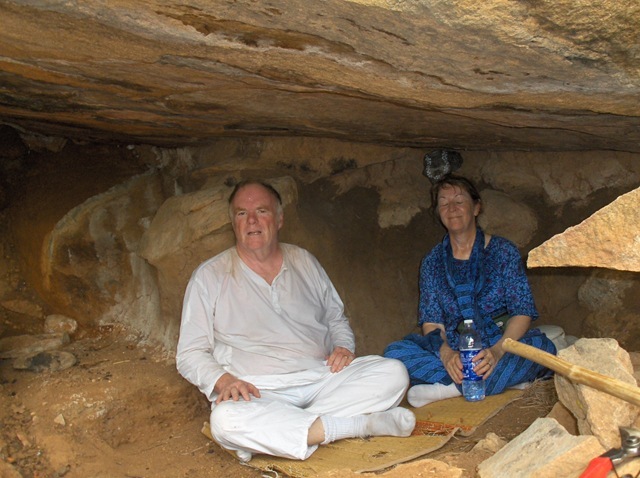 Richard and Carol, meditating in the cave. 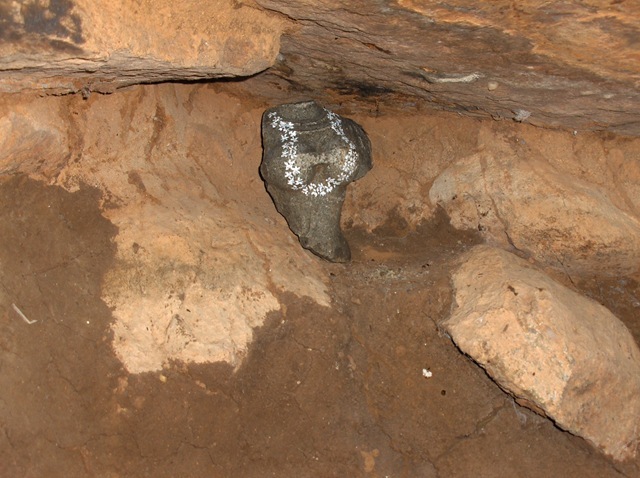 Below is part of a mother goddess statue, placed in this cave. 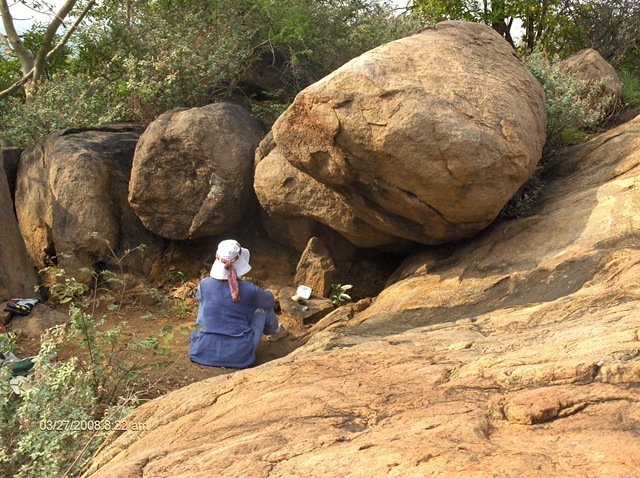 Aum Amma’s cave is the most developed of any cave we have found so far (except for those, like Virupaksha, which have had buildings constructed around them). Many bags of cement were carried up the hill to make these cave improvements. Aum Amma lived her for several years until just a few years ago. Stairs lead down into a main room. There is a good view out the “window” in the main room. It looks like sometimes that people sleep in this cave, though you are not supposed to, and if you stay too long, the Forestry Department people will chase you out. 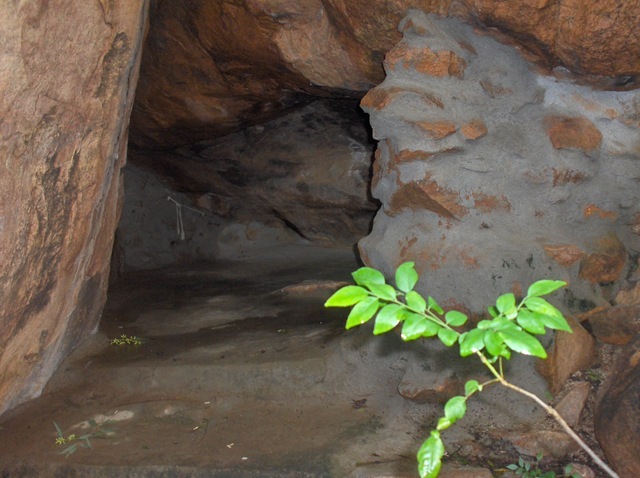 This cave is shown in the post Kattu Siva Cave. There is a nice cleared area around the cave. this is good place to come during the heat of the day. There is plenty of shade. Climbing over the rocks at the end of the clearing, a hole in the rock appears. This is Kattu Siva’s cave. A big rock, in front of Richard, has fallen into the cave. Will someone be able to remove it? 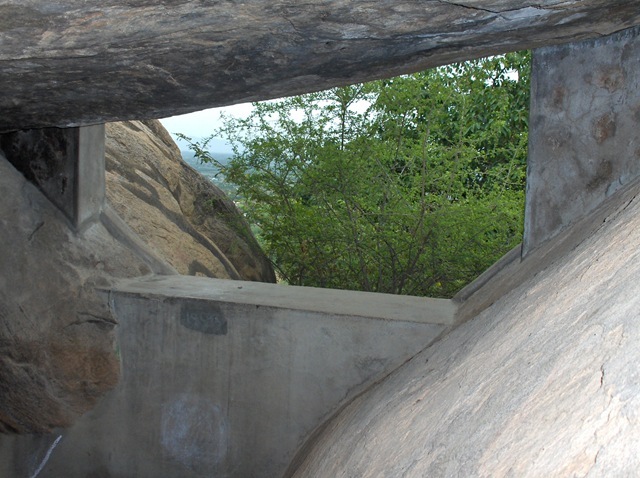 On the top of the rock over the cave, a cement water catching area was made. 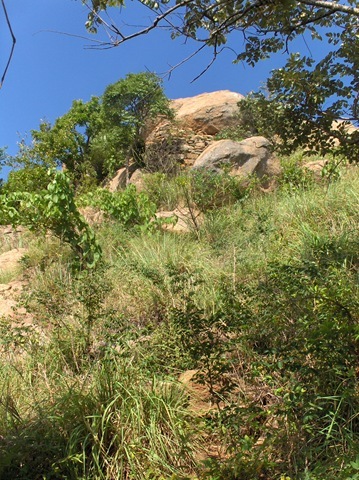 The photo below looks over this to the Arunachala hillside behind Kattu Siva’s cave. 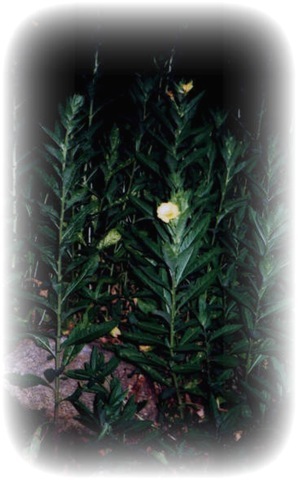 Related posts are: Kattu Siva Meditation Perch and Kattu Siva path Renewal – Part 1. This is a small unused cave. Rocks need to be cleared from the floor to make a good sleeping area. 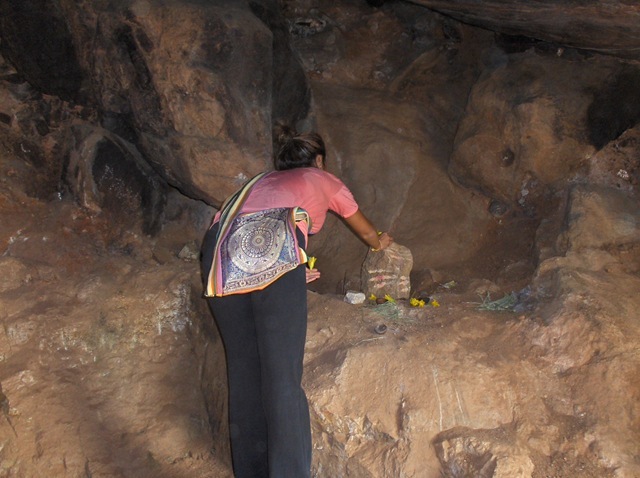 This cave is shown in the post Kattu Siva path Renewal – Part 1. 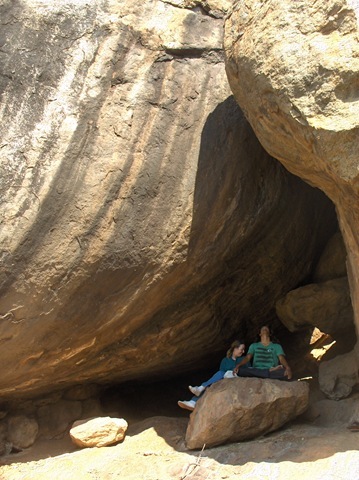 It is under a rock that looks like a natural lingam as you approach this cave. 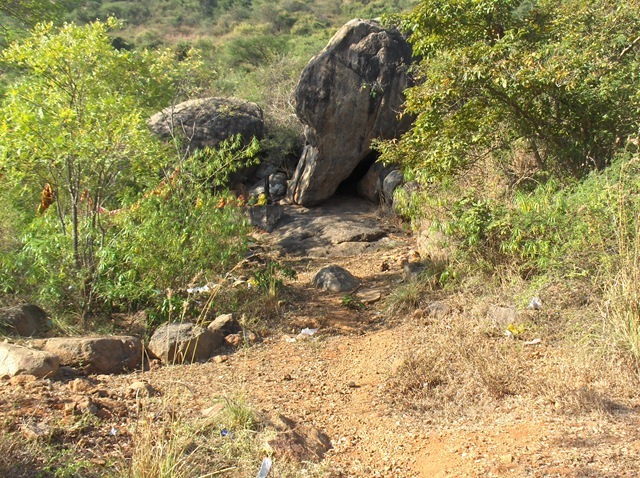 This cave is shown in the post Inner Path – Around Parvati Hill. A path leads to it from the Inner Path. This cave was improved with a stone and cement wall in front. A nice cement floor has been put in the cave. Naga Cave is shown in the map, below. This is not too far from Pachaiamman Koil. 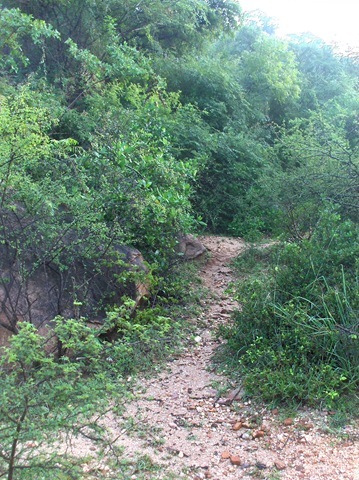 It is between the Inner Path and Arunachala, just barely visible from the path. 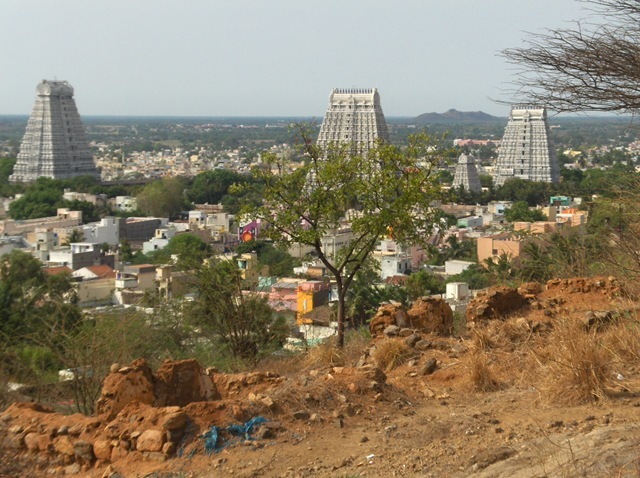 You may notice a bit of color towards Arunachala. As you approach you see a small cave. 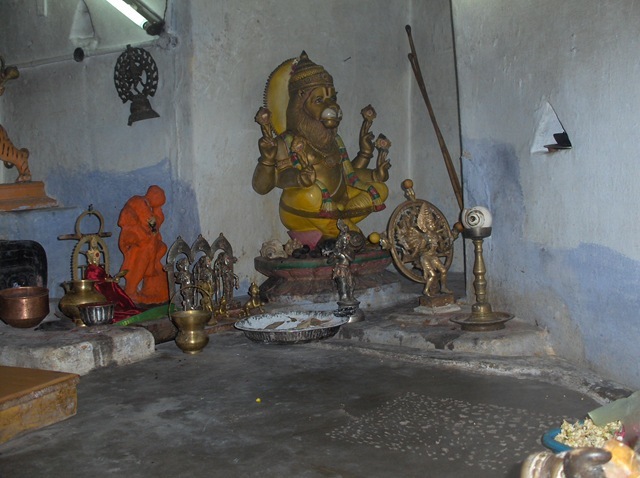 To the left is a primate altar, featuring Nagas, snake gods. 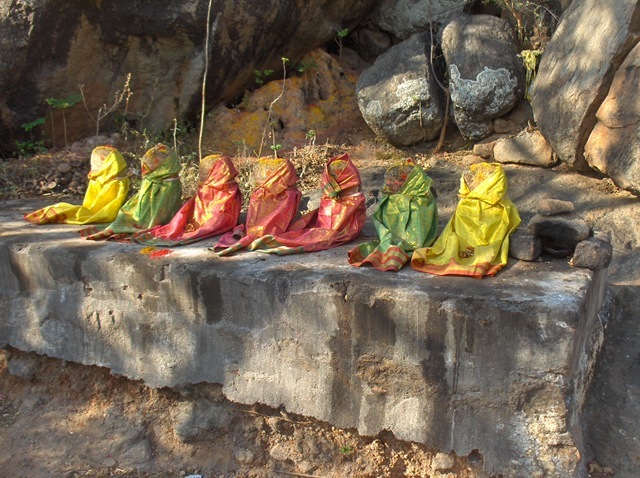 The colors noticed from the path are the fine clothes that the Nagas are wearing. The cave is small. Only one person can sit in it. Not good for sleeping, either. More is to be found in the Naga Cave Post. 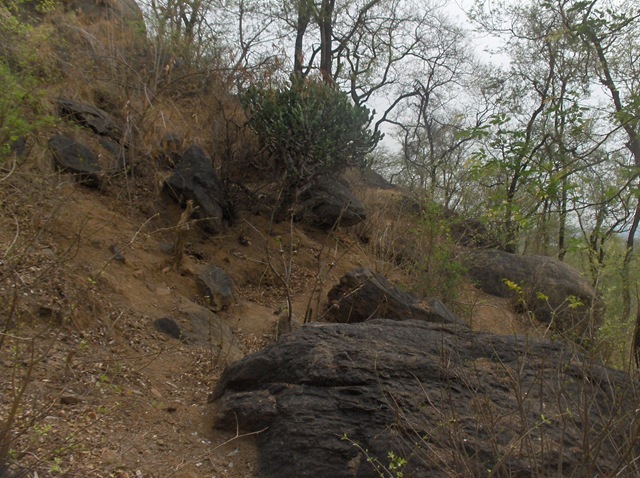 There are four caves on the hill above the Mountain of Medicine Arunachala reforestation facility. There is another cave high above Papaji’s cave. There are three caves on the north side. 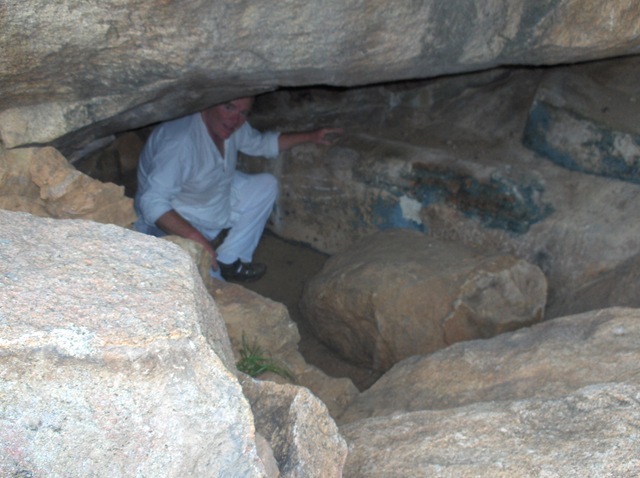 There is a cave near Virupaksha occupied by a sadhu that does not like to be bothered. What else is there? We have to explore to know more. If you know of any more caves that haven’t been listed, please let me know.